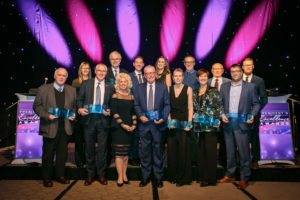 CHARLOTTETOWN – Wednesday evening was a night of celebration for the Greater Charlottetown Area Chamber of Commerce at the 13th annual President’s Excellence Awards. Sponsored by Atlantic Lottery, the awards night honoured finalists in nine categories: Excellence in Businesses, Entrepreneur of the Year, Volunteer of the Year, Customer Service Excellence, Not-for-Profit Excellence, Export Excellence, Workplace Excellence and the inaugural People’s Choice for Community Impact Award. An independent panel of judges chose the finalists from over 65 peer-nominated businesses. The winner of the Excellence in Business Award was Seafood Express PEI. Located in Charlottetown, Seafood Express PEI is a premier transportation company, specializing in transporting temperature-controlled Canadian and US cross-border shipments. They employ over 100 people and have been in operation for over 30 years. In the last three years, Seafood Express has accumulated a 30% growth in fleet size, and a more substantial growth trend in revenues due to an increased focus on their existing customer base, along with the addition of new customers in new industries. The Excellence in Business Award was sponsored by Scotiabank. Island business leader, Dan MacIsaac was the recipient of the Entrepreneur of the Year Award. In 1986, MacIsaac and his wife, Carilyn, put “everything on the line” to invest in their own business. The Kenmac Energy partnership began with a half-dozen staff and sales of 10 million litres of oil. Over three decades, MacIsaac expanded his business interests by focusing on staff, customer service and acquisitions. He also developed the chain of retail gas outlets and convenience stores branded as Mel’s. Altogether, MacIsaac’s business interests employ over 300 people. The Entrepreneur of the Year Award was sponsored by Provincial Credit Unions. Blair Corkum was presented with the Volunteer Excellence Award. Corkum has been a Chamber volunteer and champion for over twelve years. He is most known for his work on the Board of Directors as Vice-President of Finance, and for being a strong voice on the Chamber’s Advocacy Committee. The Volunteer Excellence Award was sponsored by Maritime Electric Company Ltd. The inaugural People’s Choice for Community Impact Award was presented to Bricks 4 Kidz. This award recognizes a small locally owned and operated business that has earned an engaged and loyal following and support from the community. The award recipient was determined by an online pubic vote. Other finalists included the Charlottetown Islanders and T3 Transit. The People’s Choice for Community Impact Award was sponsored by MRSB. The Great George Hotel was the recipient of the Customer Service Excellence Award for showing a strong commitment to outstanding customer service, customer loyalty, and community involvement. Other finalists in this category were The Holman Grand Hotel and Sign Craft. The Customer Service Excellence Award was co-sponsored by BDO and Cox & Palmer. The Not-for-Profit Excellence Award recognizes the accomplishments of organizations in the not-for-profit sector, which contribute to the economic, social and/or cultural well-being of the greater Charlottetown area. The recipient of this year’s award was Big Brothers Big Sisters of Prince Edward Island. Finalists included The Guild and Women’s Network PEI. The Not-for-Profit Excellence Award was sponsored by Results Marketing & Advertising. Receiving the Export Excellence Award was Navigate Food Safety. The award recognizes a business demonstrating growth in sales of their product and/or service to markets outside of Canada. True North Seafood Smoked Division was the runner-up. The Export Excellence Award was sponsored by Export Development Canada. In recognition of their efforts in providing employees with a positive, healthy and productive workplace, Target Tours was presented the Workplace Excellence Award. Finalists included AquaBounty and Cox & Palmer. The Workplace Excellence Award was sponsored by Royal Bank of Canada. The Emerging Business Award is given to a business that has demonstrated remarkable growth, innovation, and leadership in their industry sector. The award was presented to Advanced Extraction Systems with runners-up Kaneshii Vinyl Press Ltd and Radterra. The Emerging Business Award was sponsored by the City of Charlottetown.